Demonstrating the awesome power the Angry Birds franchise still has on mobile, Rovio announced today that it saw 30 million total Angry Birds downloads during the Christmas period, 8 million of them on Christmas Day alone. 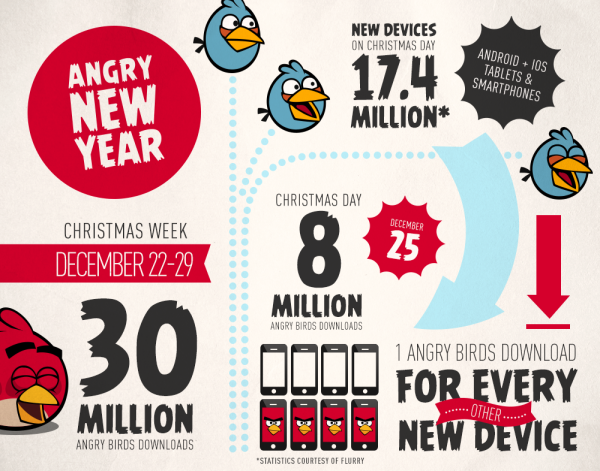 2012 was another big year for Rovio. In May, it saw total Angry Birds downloads surpass the one billion mark, adding 500 million in just six months. The company also made ground on its Angry Birds movie project, bringing on ‘Despicable Me’ producer John Cohen ahead of its Summer 2016 release. Angry Birds still sees more than 200 million active monthly users across all platforms, incredible considering it was first released back in December 2009. This has, of course, been helped by constant updates to the franchise, which included a partnership with Lucasfilm’s own (now Disney’s) Star Wars franchise. With smartphones and tablets now a popular gift at Christmas, Rovio’s Angry Birds titles are still the go-to downloads for young and old users alike.